H.E. Heinz Fischer, president of Austria, discusses the importance of learning from history in his address at the JFK Jr. Forum yesterday. 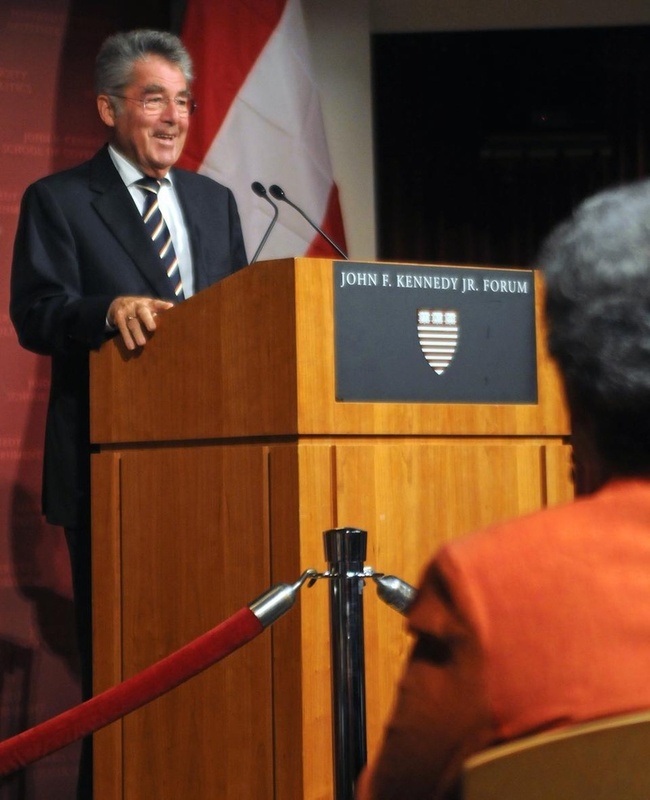 Austrian President Heinz Fischer analyzed his country’s role in Europe from the postwar period to the present in a public address to a full John F. Kennedy, Jr. Forum at the Institute of Politics last night. “Austria was the border where the Western world ended and the Eastern world started” Fischer said, stressing the part Austria had played in “sheltering refugees, democratizing former communist countries, and introducing market-based systems” during and following the Cold War. Fischer, the first Austrian president to be invited to speak at Harvard, emphasized that Austria has always been a center of international affairs, especially aiding Eastern European countries. Austria’s decision to enter the European Union in 1995, following a referendum, significantly influenced economic recovery in Eastern Europe and ultimately the EU accession of eight post-communist countries in 2004. “I believe the European Union is an instrument of peace,” said Fischer, who returned to Harvard after having taken a post graduate seminar taught by former U.S. Secretary of State Henry Kissinger ’50 43 years ago. “Never in history has such a creation, unification been a peaceful development,” he said. But Fischer also warned of nationalist antagonism, skepticism toward the EU, and domestic political parties railing against immigrants to rally their constituencies. In this context, Fischer explained that on a daily basis the role of an Austrian president requires objectivity and non-intervention, yet demands that he defend key issues like human rights. “[European unification] is naturally complicated and full of criticism,” he said.Fischer enjoys high popularity in Austria, as evidenced by his re-election this April to a second six-year term with almost 80 percent of the votes. Consequently, there was high demand from Austrians living in the Boston area to secure a seat in the private meeting with the president prior to the public address, said Gloria Benedikt, Vice President of the Harvard Club of Austria Student Chapter. “To raise awareness of the declining quality of university education in Austria, I questioned Fischer about his reform plans for the Austrian education system,” she said. Education, especially international exchange programs and financial aid initiatives, dominated the informal discussion held in German between Fischer and 30 Austrian students and faculty, she added. Fischer departed only three hours after his arrival in Cambridge to represent Austria at the United Nations General Assembly in New York. Audience member Taras B. Dreszer ’14 said he was impressed by Austria’s rapid recovery following regime changes in the first half of the 20th century that even enabled Austria to aid its neighboring countries after World War II. “Austria clearly learned from its history. Now the United States should take the opportunity to learn from Austria,” he said. Students and faculty packed into the Belfer Case Study Room on Friday to hear about inequality in post-abolition Brazil from Brodwyn Fischer, a history professor at Northwestern University. The event, titled “Poverty, Social Intimacy, and the Politics of Inequality in Post-Abolition Brazil,” focused on the historiography of a city in Brazil called Recife.